This instructional course is for people who want to look over the full range of skills required for summer walking and is suitable for both people with little experience or already experienced hill walkers. Navigation will be a big part of the course but we will also look over many other skills and factors to be considered. 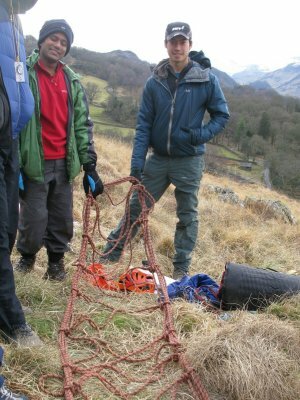 We tend to run the majority of our hill skills courses in the Lake District, a brilliant venue for this type of course. We can run this course in other locations on request though, please Contact Us to discuss. night navigation. Navigation by head torch. This can be an additional 2-3 hours out on the mountain at a small extra cost (£20 per person) and is best run outside the Summer months when it is darker earlier. Note – if you are looking for a more navigation skills focused course then see Summer Navigation course. All technical equipment can be supplied at no extra charge. Note – We run Hill Skills courses at a 1:6 instructor client ratio max. We can supply additional instructors for larger groups wanting Hill Skills or you can look at Group Programmes for group activities which can include guided walks for groups. Paddy Cave guided me for four days on Skye. He has huge skill and experience; he kept me safe and taught me new techniques. In addition, he is great to talk to, with fascinating accounts of mountains and mountaineering. I would recommend Paddy as a guide whether you're into hill walking or ice climbing. I've followed Paddy's lead all over Scotland for the last two years, both winter and summer. He always finds routes that push me enough to make them really memorable. With his advice and vigourous encouragement, I have safely made it up routes I thought beyond me. Looking forward to the next trip. ! 'Paddy oozes enthusiasm and inspires confidence to challenge yourself to achieve things that you didn’t think possible. A winter skills course led to mountaineering skills then rock climbing and now we’re off full Scottish winter mountaineering'. I have worked with a lot of good instructors in the lakes over an 18 year period and Paddy stood out by miles. He doesn't just get on with the activity you have chosen, he is genuinely interested on what you or your group want to achieve. He takes the time to listen to you on what you want. Since our first meeting I have always booked Paddy and will continue to do so. No matter whether it is Gorge Scrambling, Climbing, Abseiling, Canyoning, ML training, Paddy will go out of his way to make sure you or your group have a good experience. He will try to tailor make a good day from the budget you have and he gets his buzz seeing you or you group of people achieve no matter what the age. I have no hesitation in recommending Paddy Cave and his team to any individual or group who want a good time in the outdoors. Just give him a ring or email him! 'Extremely knowledgeable, fun and well delivered, the course was tailor-made to whatever one wanted to know, a great experience'. Through Paddy’s tuition I’m so confident in my ice axe arrests I relish falling off steep edges so I can put the skills into practice. Paddy has delivered Winter Skills courses to our club for a number of years. They've always proved completely invaluable, not just in terms of the personal satisfaction and enjoyment our members get out of learning such skills under the knowledgeable and experienced tuition Paddy offers, but also because of the new skills those members then go on to bring to the rest of the club, enhancing and making safer all of our winter mountain experiences. Having now just spent four Scottish winter days on a variety of climbs and ridges with Paddy from Aviemore to Glencoe and the Ben, I feel privileged to have experienced such an atmospheric environment in the safety and direction of a true professional; with lasting memories until next winter’s challenge! Copyright © 2019 Mountain Circles. All Rights Reserved.